It’s intentional. Our neighborhoods are filled with people who chose Twin Lakes for various reasons, but, the one thing they have in common is the desire for a well-rounded life surrounded by people who are engaged and open to new activities, new people and new ideas. Busy, laid-back, or a combination of the two, Life at the Lakes is filled with possibilities and purpose. Take an exercise or a swim class. Expand your artistic talents or discover them for the first time. Create a masterpiece or a simple creation in our fully-equipped woodworking shop. Enjoy the spirited competition of bocce, pickleball, and horseshoes, or the solitude of a good book in our library. Take a walk or ride a bike through our beautiful expansive grounds or simply enjoy the company of some of the best friends you have ever known. All this and more, and you haven’t even left the boundaries of our community to discover the abundant opportunities the broader community offers. 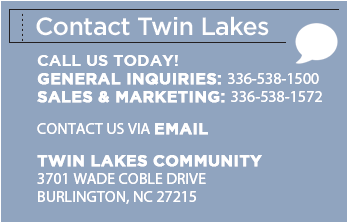 Contact us today to set up a visit of our community.